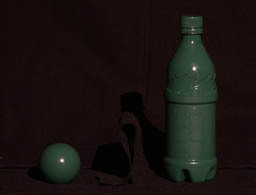 The surface reflectance, illumination, and shape may all be unknown. 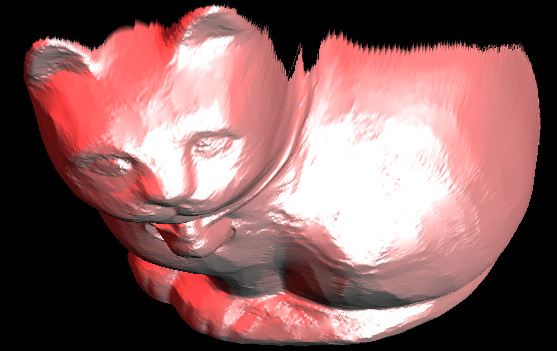 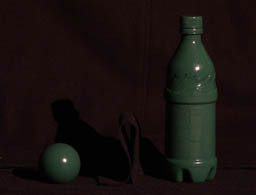 Moreover, the reflectance may be arbitrary and can vary over the surface. 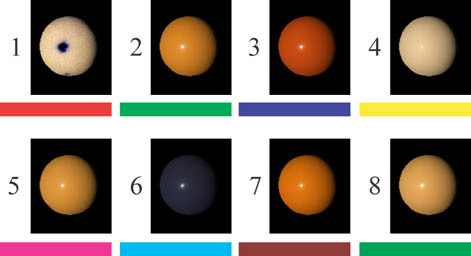 The approach will work with any number of distant point or area light sources. 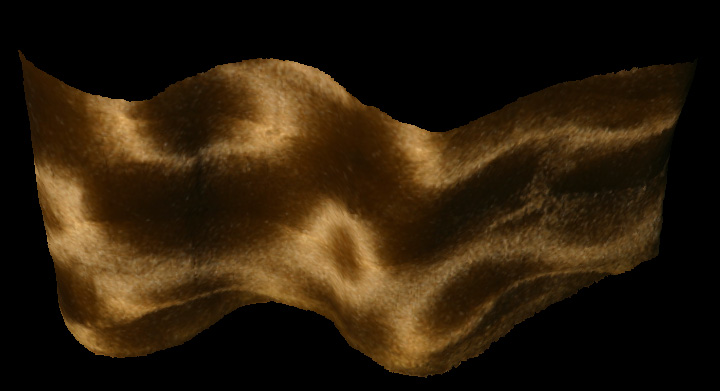 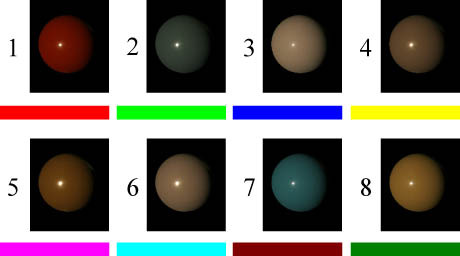 The algorithm is extremely simple to implement, yet operates on a broader class of objects than any previous photometric stereo technique, and achieves impressive results for a wide variety of challenging materials ranging from shiny objects to velvet and brushed fur. 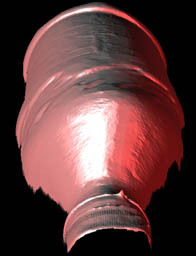 The quality of results on shiny objects compares favorably to the performance of commercial laser scanners on diffuse objects. 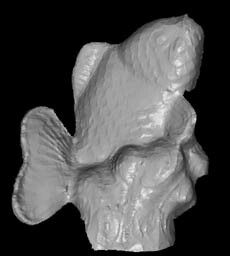 Click on the images above for full-size reconstructions. 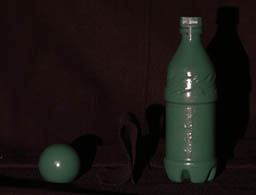 Eight illumination conditions were used in this experiment. 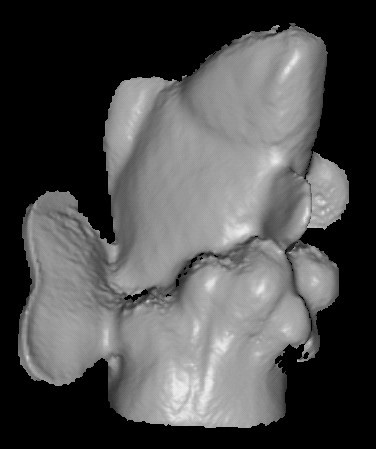 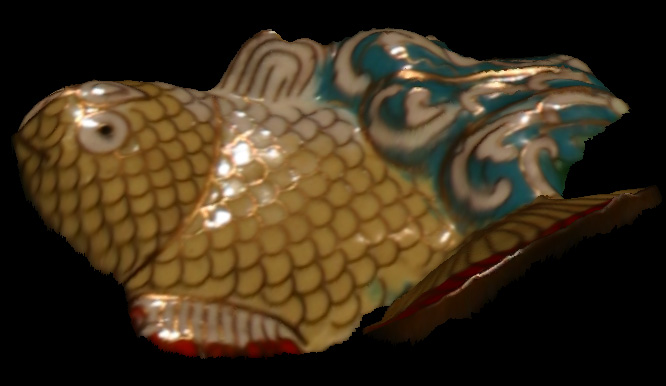 Here is our 3D reconstruction in PLY format, which can be viewed using Scanalyze. 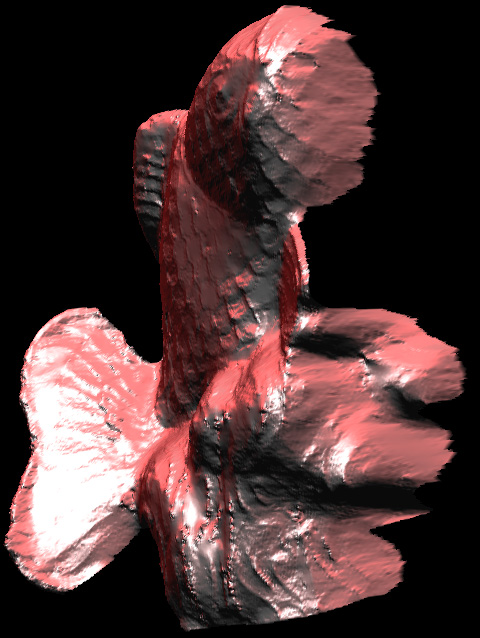 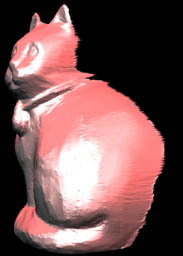 This approach can be directly applied to reconstructing materials that are normally very difficult for computer vision algorithms, including velvet and anisotropic materials. 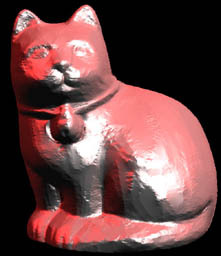 To our knowledge, this is the first time in the computer vision literature that a shape reconstruction technique has been successfully applied to an anisotropic material. The reflectance in this example is sufficiently complex that it is very difficult for humans to perceive the shape, yet the algorithm performs quite well. Here is a comparison of our reconstruction, with a laser-scanned version of the same object (using a CyberWare Model 15). 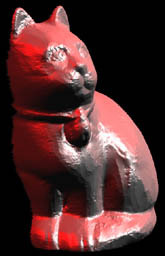 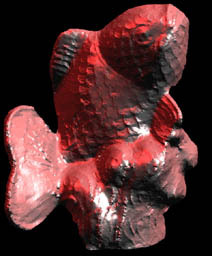 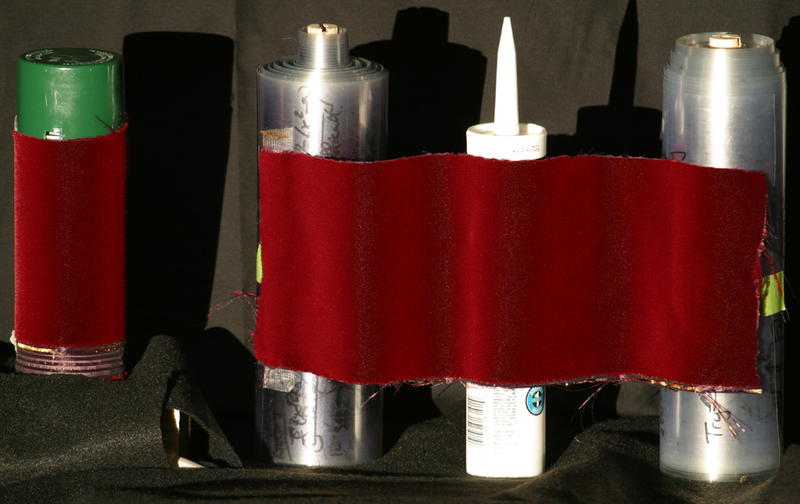 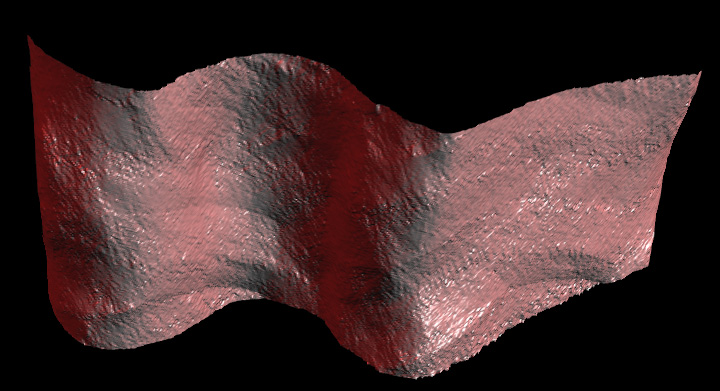 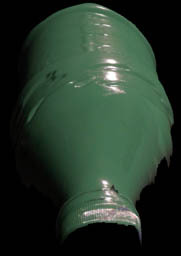 In order to laser scan the object, it first had to be covered with a thin diffuse paint. 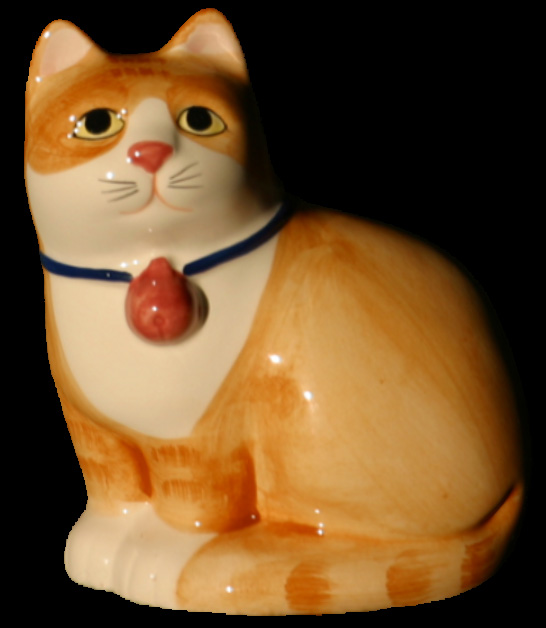 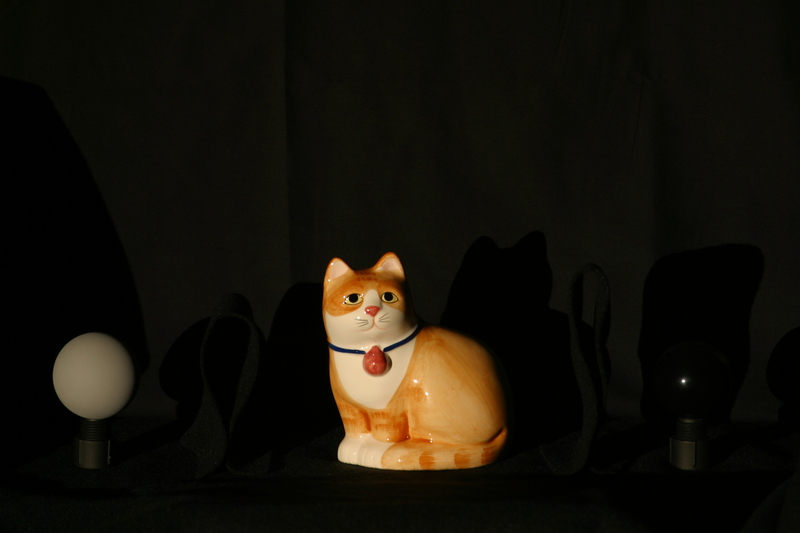 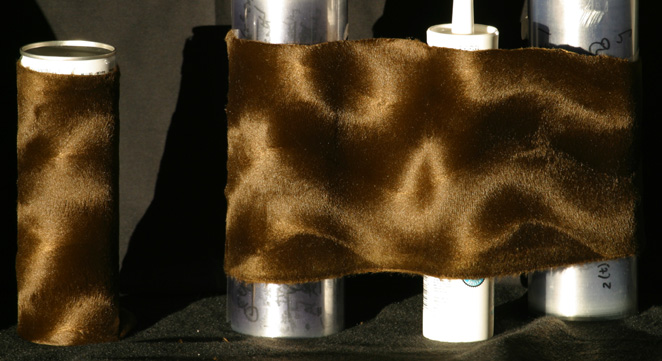 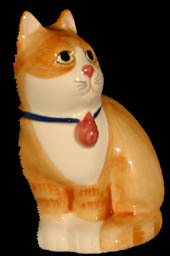 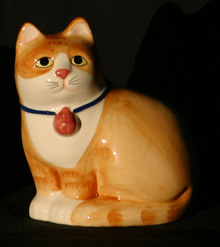 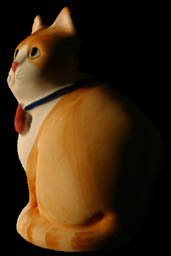 Nonetheless, our method extracts distinctly more surface detail than the laser scanner. 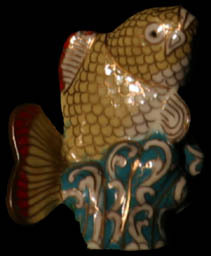 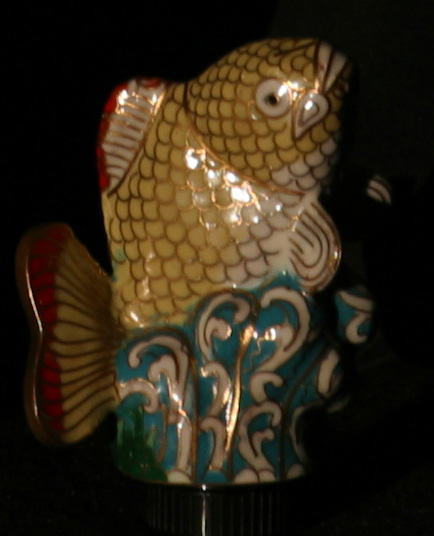 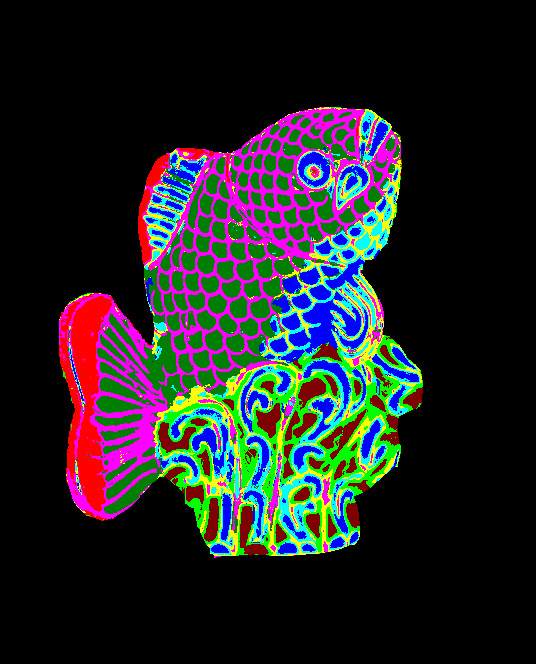 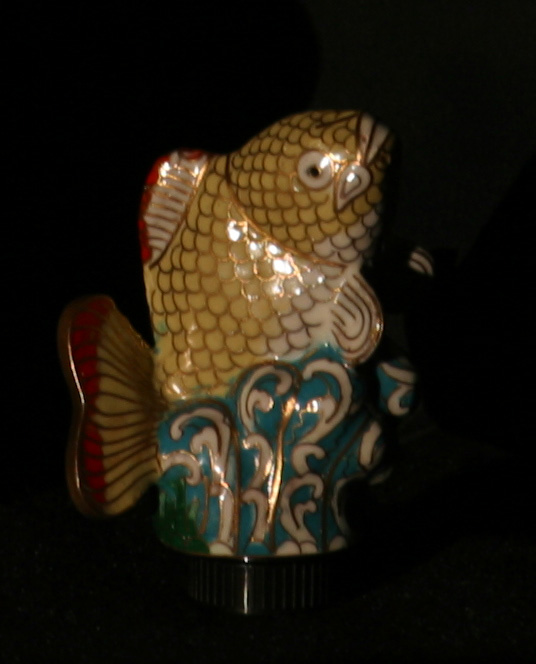 While some of this detail is likely due to the higher resolution of the camera compared to the laser scanner, other differences may be due to the fact that the fish is coated with a thin layer of transparent lacquer. Our approach is likely capturing the surface under the lacquer---which does contain a relief texture, while the laser scan of the painted fish captures the smoothed, lacquered, outer surface. (The above PLY format meshes may be viewed using Scanalyze). Here is our 3D reconstrustruction in PLY format. 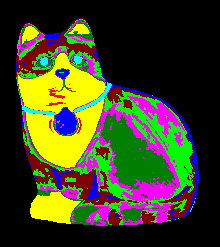 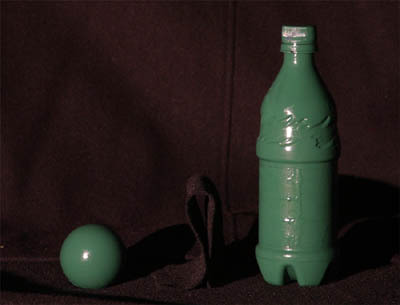 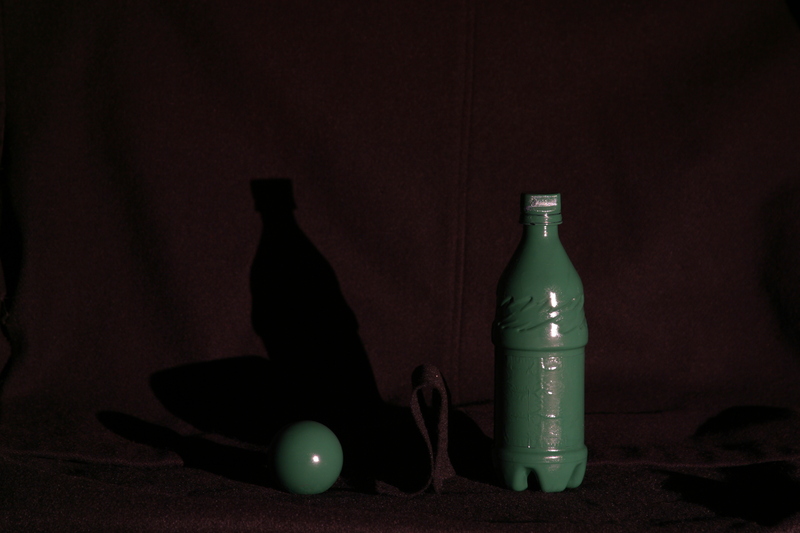 Most image segmentation techniques operate directly on image pixels, and are unable to distinguish shading variations from material (e.g., albedo) variations. 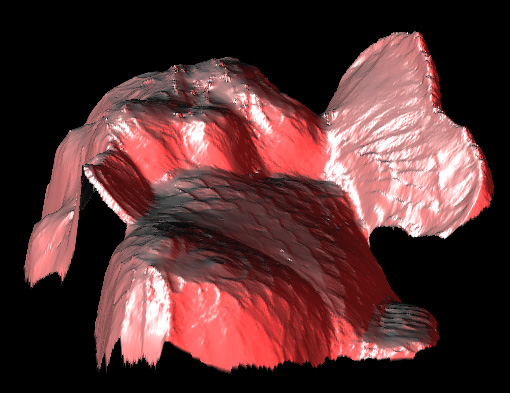 Our algorithm makes it possible to cluster materials on the surface, while avoiding some ambiguities in the surface materials (see the paper for details).